Show me something I can put maple syrup on and I’ll show you me abusing that option. While I stop short of spaghetti, I seek out foods where it is appropriate. Yogurt. Ice cream topping. Cereal. And this: porridge! 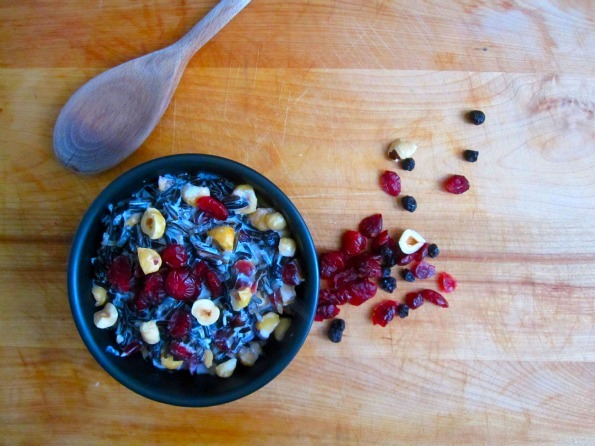 Wild rice porridge can be a welcomed addition to your Thanksgiving spread. It is crock-pot friendly (score! ), it’s unusual without being wacky (score!) and it’s full of warm fall flavors (triple score!) If you need more reason to be excited, it’s also highly adaptable to your favorite fruits, nuts and seeds as well as amenable to adding spices like cinnamon or nutmeg. How about a splash of vanilla? Or maybe bourbon. That’ll settle the kids down. Driving home from a weekend away, we wondered why it was getting so dark. Sure, it was raining. Sure, there were overcast skies. But the real reason was because it was 4pm and the sun was starting to set. Welcome to Fall. It’s time to make soup. 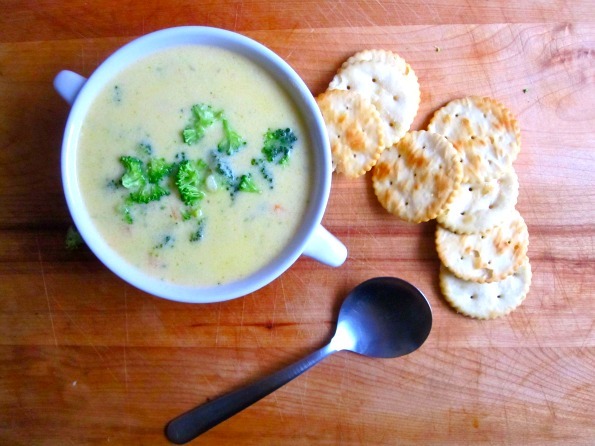 Continuing on the theme of butter becoming my signature scent, I thought I’d whip up a broccoli-cheddar soup that would be a little but sunny (because cheddar is orange!) and a whole lot comforting because that is what creamy soups do best. According to my nutritionist, broccoli is the #2 superfood second to kale. I don’t much care for kale although I have discovered that covered in expensive cheese, it’s quite alright. Broccoli though, I can eat that plain; by the fistful even. While it’s no number one, I make up for it in volume. It would be appropriate to note that I do realize I’m mentioning how I eat broccoli plain in a recipe for it covered in cheese but hear me out, it’s not expensive cheese. It’s regular cheese. Take that, Kale. Word on the street is that these very scones are what the Queen of England demands for breakfast each morning. She eats promptly at 6am and her meal is comprised of one perfectly round scone and one cup of Earl Gray tea. With milk. If it has been a particularly stressful week she will request the kitchen make a burnt, fruitless, chocolateless batch of these scones which she will then throw at Prince Charles while he is wearing the kilt she hates the most. The dogs find this quite fun! You’d be surprised at how well she can throw. You would! It is very surprising. Once the servants clean up the mess it is off to her busy day of official duties like meeting with the Prime Minister and shaking hands with hundreds of visiting dignitaries. 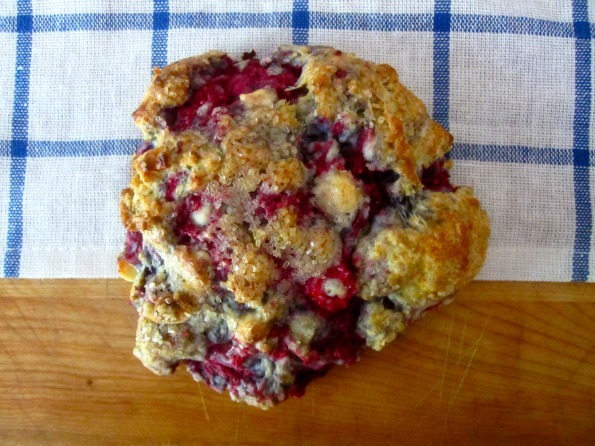 Or these scones could just be a really good way to use up buttermilk. Your call. 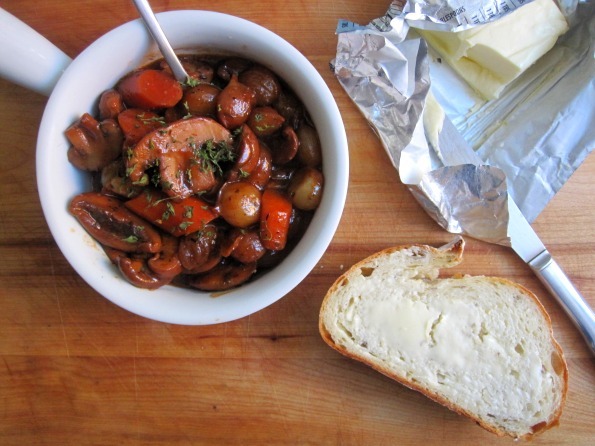 I could have called this post Why-Julia-Child-Would-Have-Good-Reason-To-Hate-Me Bourguignon but that’s nowhere near as catchy as Champignon Bourguignon. Please, say it out loud, or at least enthusiastically in your head, with your best/worst French accent: Champignon Bourguignon. Champignon Bourguignon. It’s especially fun when said with disgust, which I would guess is how most French people would say it. Champignon! Bourguignon! Non! I used frozen pearl onions. FROZEN! I lessened the amount of wine and it was not with the intent of leaving more for me to drink. French chef fail! This whole thing takes about an hour, not the epic 6 hours of the original. I crowded the mushrooms. I crowded them real bad. I repeated “champignon bourguignon” in my head in an absolutely terrible French accent the entire time I was making it. This could be an “easy weeknight meal” — WHAT? A bourguignon? NON! I don’t even OWN a string of pearls. But before we get too discouraged, Julia would have one reason to like me a whole bunch: I’m pretty liberal with the butter. My friend Jason and I use to play this game where we would think through absurd scenarios of what-ifs. Like what if metal expanded when it froze instead of contracted? What if lakes froze from the bottom up? Or my favorite, what if pineapple pizza was the everyday pizza and pepperoni was something you got when you were feeling wacky? We took these questions very seriously. 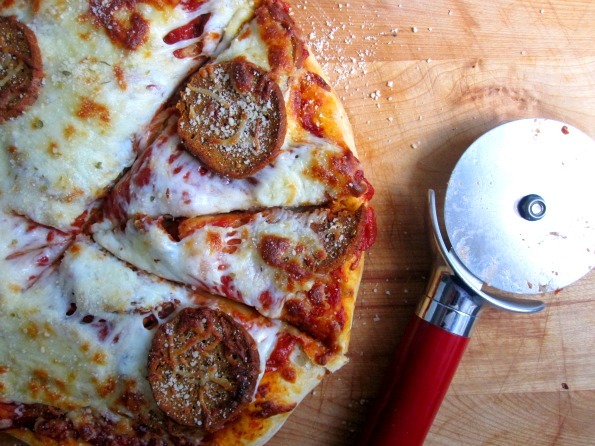 Let me post this question to *you* — what if fake pepperoni was the new pineapple in the pepperoni pizza question above? Did I just blow your mind?